We want all our volunteers to have the same basic foundational principles in ministry methods, crosscultural engagement, evangelism, and leadership. This collection of resources will boost your experience and give you a common language as you join us on campus. Each international student you meet will have their own experiences and worldviews based on their cultures. Recognizing how your culture shapes your own worldview will help you cross cultures well, and give you insight into the different cultures of the students you meet. The differences between cultures aren't bad, they're just differences! Whenever people from different cultures interact meaningfully, cultural dissonance will occur. We use the Approaching Differences diagram to guide us through cultural dissonance. Watch this short video on navigating cultural differences through the approaching differences diagram. Cultures are generally influenced by one of three main worldviews: honor/shame, power/fear, and innocence/guilt. Though we all experience each, different cultures place more importance on and are shaped around one of the three. These worldviews can be seen in how society works and in how the gospel is understood. The Innocence/guilt worldview places stronger emphasis on personal accountability and wrongdoing-courts center around discovering innocence and punishing the guilty, and the gospel is explained through personal forgiveness of sins. The honor/shame worldview emphasizes the harmony of a collective group-things or people that disrupt that harmony bring shame upon those around them, such as children not following parents' expectations, and the gospel is explained through God taking on others' shame to resore their honor. The power/fear worldview emphasizes the spiritual forces at work-luck, charms, curses, and spirits-where the one with more power will provide protection and should be followed; the gospel is explained through God's ultimate power in the world. When you have spiritual conversations with students, be sure to follow the InterVarsity Code of Ethics. Because culture and worldview are so interconnected, you should have an awareness of how cultural values show up in spiritual conversations. As Christians, we hope that seekers ask Jesus for forgiveness for their sins and ask him to live in their hearts. This is good. But often in a cross cultural environment, this prayer can be misunderstood and be empty words. What we hope for in anyone, from any place, is a deep heart change and devotion to Jesus. As you can imagine, when language and contextual differences exist, there can be many misinterpretations about the Gospel. To be effective, we must remove our Christian terminology and speak in everyday language. Culturally, international students may say yes to you to be polite – even in response to the Gospel. To effectively share the Gospel, we must do our best to have some understanding their culture and background. Student evangelism used to look like a line of "convert -> be discipled -> enter community." However, international students (and postmodern students in general) tend to follow the path of "enter community -> be discipled -> convert (and continue discipleship)." Creating a welcoming family atmosphere where students hear about Jesus and learn what it means to follow him is crucial. As students go through this process they pass through the 5 Thresholds. Knowing the 5 Thresholds will help you understand what barriers students still have to Christianity and will give you guidance for next steps. Watch a video on using the 5 Thresholds. These new paths mean that students who are still just curious or seeking Jesus may take on roles that traditionally only Christians held, such as leading a Bible study. As they wrestle with questions or share something with others, they are drawn closer to God. Since barriers aren't always theological knowledge but rather cultural concerns, some non-Christian international students have even given a call to faith, sharing the gospel message-and then made the decision themselves! Part of our vision is to see world changers developed-we want to send international students back out into the world as influential Christian leaders. Disciplesip, leadership development, and a robust reentry ideology are all key to realizing this vision. In the West, we have developed a successful form of discipleship including daily devotion, time with God, and one-on-one meetings with a mentor. When discipling international students, we must remember that our way is just ONE way of discipling. Discipleship’s goal is to help grow our relationship with Jesus through scripture and prayer. This can take many different forms. Many international students come from communal cultures, where discipleship is done in a group rather than in solitude. Some come from oral cultures where a conversation about scripture and another’s life experience may be a form of discipleship. Some students may prefer having a more organic relationship with a mentor, having dinner and being included in normal life rhythms. We must be flexible with our form of discipleship in order to have lasting impact. 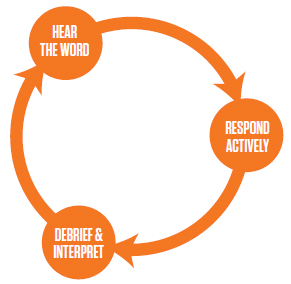 One tool we use to disciple students is the Discipleship Cycle (DC). The DC is a way for students to hear what God is saying to them, respond to it, and then reflect on the experience in order to learn and move forward: Hear the word, respond actively, debrief. You can read more about each stage and find some examples here. In Western communities, we respect a leader who is charismatic, assertive, takes initiative, and has unique ideas. But many international students come from cultures where it is inappropriate to “stick out.” An Eastern proverb says, “The nail that sticks up must be hammered down,” exemplifying the cultural value to blend in. Students may have a lot of leadership gifts, but we may be blind to them. They may be quiet, yet have amazing leadership gifts like influence, respect, and wisdom. When we invite students into leadership positions, we need to remember these differences and be careful not to overlook someone. Because leadership means different things in different cultures, inviting international students to lead in a chapter requires a different approach. We use the Leadership Pathway as a tool to invite students into increasing responsibility. By using family oriented language and asking students to serve the community in specific ways, you encourage them to take these steps into leadership in culturally friendly ways. Preparing students for reentry is perhaps the most important thing you do on campus. If we want students to return to their home countries as influential Christian leaders, they need to have a deep understanding of how to continue in their Christian walk in places where they lack family and social support. Our goal is to embed reentry principles into what we do from the moment we meet students, such as ask, "How would this work back home?" during Bible study application, encourage students to pray in their own languages, or hold topical discussions about life after college. Then, when it's time for them to leave campus, send them off with connections and resources!